I mentioned the other day that I preferred Ktorrent over Deluge for RSS Bittorrent downloads. Well I lied. I found Ktorrent to be way more resource intensive as Deluge, so I switched back. I also said Deluge's RSS plugin didn't work well for me. That was because I wasn't doing it right. That's where this article comes in. I'm sure many of you want to download your favorite TV shows using a service like ShowRSS on Linux, but don't know how. Or you see tutorials on using Flexget and another client, and it seems too complicated. Well, you're not alone. 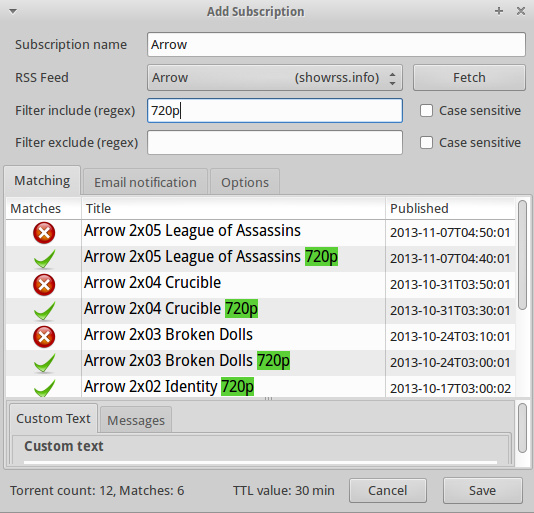 Using Deluge to download torrents via RSS is actually pretty easy, and here's how you do it. Click Install Plugin and browse to the YaRSS2 .egg file you downloaded in the first step. Now you will notice that your torrents will begin downloading. Deluge is smart enough to record the time stamp of the last download too so that it doesn't accidentally download the same file twice. That's it! Just go through this process for any other shows you want to download, and you are good to go. No text config files to edit, nothing! Just pure Torrent RSS Downloading!